Alexei Nalogin: "I didn't want simplicity; I wanted luxury, but accessible luxury." Alexei Nalogin lost the ability to walk after an unsuccessful operation when he was a teenager. Recently, he invented a super-light wheelchair. This is just one of his 50 innovations over the past 15 years. Carbon is often used for making racing bicycles because it is stronger and lighter than steel. Today, there are also wheelchairs made from carbon. They are so much lighter than standard ones that a disabled person can take them out and put them in cars without any assistance. Their price ranges from $4,000 to $12,000, but Russian inventor Alexei Nalogin has unveiled a model that costs less than $2,000 and weighs only 5.4 kilograms. "First I made one for myself," said Nalogin. "This wheelchair is not for extreme activities, and you can't race it off-road. This is a wheelchair for formal engagements at the theater, or in restaurants. For example, I have a tuxedo that is perfect for this wheelchair." Nalogin's wheelchair comes in black and red, black and blue, and in blue. Their backs are lined with cashmere. "I purposely refused to use plastic decoration," he notes. "I didn't want simplicity; I wanted luxury, but accessible luxury." 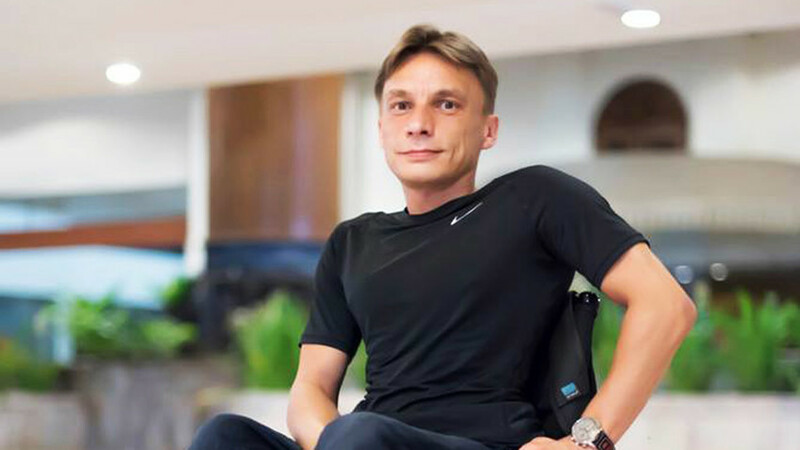 Alexei has created more than 50 innovations that improves life for the disabled. His company, Dospekhi, specializes in rehabilitation technologies. One of his most famous inventions is an orthopedic system, or an exoskeleton, which helped him get out of bed nine years after the unsuccessful operation on his spinal column. For the past several years he has lived in Thailand, where he continues work on new inventions. In 1990, when Nalogin was 13 years old, his back began to ache. It turned out to be sarcoma of the spine. "They operated immediately, as soon as they made the diagnosis, without taking me off the table," said Nalogin. "Then, there were chemotherapy treatments." After some time the doctors said that Nalogin would suffer a relapse. But after the second operation he could no longer get up. It turned out that the doctors were mistaken; there was no relapse. At the age of 19 Nalogin began his self-education. "I started with programming, with Internet design, then Internet advertising, and I made a lot of progress in this field," Nalogin recalls. He learned English, which now he speaks fluently but with a slight Thai accent. On the Internet he came across the Russian Children Clinic's website. "The site was weak, and so I wanted to help them." Two weeks after the launch of the new site, the clinic raised enough money for two children's bone marrow transplants. Subsequently, this site led to the establishment of the Gift of Life Foundation. In 2001 the American Ford Foundation recognized Nalogin's children's charity project as one of the most effective in the world. Nalogin received a patent for his exoskeleton in 2004. "I was the only one in Russia doing such work at the time, but today many companies are doing it," said Nalogin. Several hundred Russians have already benefited from Nalogin's innovation. "In autumn I plan on launching new devices and new technologies; for example, the production process and the exoskeleton's external aspect will be perfected." The inventor believes that if he had worked in Russia, he would not have been such a success. "A package goes from Beijing to Thailand in 22 hours, and a shipment from the U.S. arrives in a week," said Nalogin. "In Russia, they are happy if a package arrives in 30 days. I make constant orders since I create prototypes. I have an idea, then draw it, send the sketch in 3D to China; and the factory there makes a prototype. For me it is important to test it, see how it looks, touch it with my hands." Thailand also has a unique system of public workshops for aficionados as Alexei, and he visits them almost daily. "They have enormous workbenches and small tables, like in a café; there's everything you need — 3D printers, a laser lathe that cuts out shapes from wood, and so on," said Nalogin. "Such a place is indispensable for someone who loves to work with his hands."